Before I say anything, you guys have to understand how much of an impact your comments and support made on me yesterday. I was nervous to post bathing suit photos and you guys blew me away with your kindness. So many of you told me you felt the exact same way I do about your bodies, and that you too vow to not miss out on this Summer, like you've done every other Summer. Yesterday was cool, I was downright giddy all day long as I read your comments. Someone get me to a pool right MEOW. LOLZZZZ maybe not that pumped about Summer, but y'all have me feeling pretty excited, I've got to admit. Speaking of excited, I started a new project last Thursday! This really has nothing to do with my blog, but everything to do with what I've learned from growing my blog and social media over the years. Here's the deal: there is a huge market for local Instagram accounts and I WANT IN. My favorite thing in the world is doing something, anything. If I'm not just sitting on the couch watching TV, I'm a happy camper. I want to grow this into an account that gets invites to new restaurants, events, parties, bars, concerts, festivals, 5ks, sporting events.... anything, everything. Hey, just being honest, that's what I want! I follow a bunch of Dallas-focused accounts, and they are all getting these invites that my personal account, @iamsarahwebb, has never received. So, I started a new account this past Thursday, Dallas Love List, and am going to try and grow this sucker from the ground up. I started with zero followers on Thursday, and have grown it to about 90 followers in 6 days. Here's what I've done so far. I want these people, in particular, to know I exist and to know how active I am on Instagram. Maybe when they have a new promotion coming up, I'll pop up in their mind because I've liked every photo they've ever posted. There is a big difference between a good comment and a crappy comment. "I didn't realize you guys were in oak cliff!! That's where I live, I'll be visiting ASAP!" Beautiful Capture -or- leaving two random emojis like a firecracker paired with a pink heart. Want to hear something funny? I posted a photo on @iamsarahwebb, and then minutes later on @dallaslovelist using a handful of the same hashtags. I got the exact same comments from people clearly paying no attention to the photo and just leaving the same comment on every person's picture in the feed. Personally, that turns me off and is a waste of your time. If you're going to leave a comment, do it right. Take your time and tailor each comment for the picture you're commenting on. I'll be sitting on the couch at 9pm liking photos, trying to get the name "Dallas Love List" out there and on people's screens. Oddly enough, I think this works really well for local accounts, compared to personal accounts. I think people are more likely to click over to see what @DallasLoveList is all about vs. what @iamsarahwebb is all about. I took every good Dallas photo I had taken over the past 4 years, edited it, and moved it to a Dropbox folder that I can access from my phone. It's everything from photos of our skyline, to coffee, to meals I've had, to local murals, to cocktails. I'll obviously get more content as I go, but I have a fully loaded arsenal of fantastic photos ready to post throughout these first few weeks. My goal is to post 2 photos each day for the first month. I obviously have grown up (for lack of a better term) on the blog side of instagram. The side where bright colors linked to #ABMLifeIsColorful is where all of the likes are at. My goal will be for my account to be bright and colorful. I want it to jump off the page at people, with a great mix of mouth-watering food, colorful murals and cocktails. Photographing food will be the biggest challenge for me. I get self-conscious taking pictures of my food in a restaurant, I feel so basic, so "annoying hipster" when I do that. Not to mention I never want to make my friends not enjoy going to eat somewhere with me! That will be a challenge, stay tuned on the results of that one. Perhaps I'll have a new post, "How to have a food instagram account without losing every friend you have." I'm not at all opposed to regramming on this account, which is something I probably wouldn't be inclined to do on my personal account. Although I don't foresee this happening in the near future, maybe #dallaslovelist could catch on as a popular local hashtag that other accounts will use. Does this need more explanation? If you're trying to grow, and not using hashtags, you're going to need a wild amount of luck to succeed. I've been using a mix of local hashtags that I've found through exploring other accounts, and a few hashtags that I often use on my personal account. Still don't believe me!?!?! Look at the number of likes on my account so far, versus the number of followers I have. I think most people will suggest you upload a bank of photos to start your account. I did not do this because I wanted to use hashtags on every post, and I also didn't want to flood a hashtag feed with posts just from me. I find that annoying, so I didn't do it. To each his own though. Obviously you want to tag every restaurant, venue and even neighborhood associated with the picture you're posting. 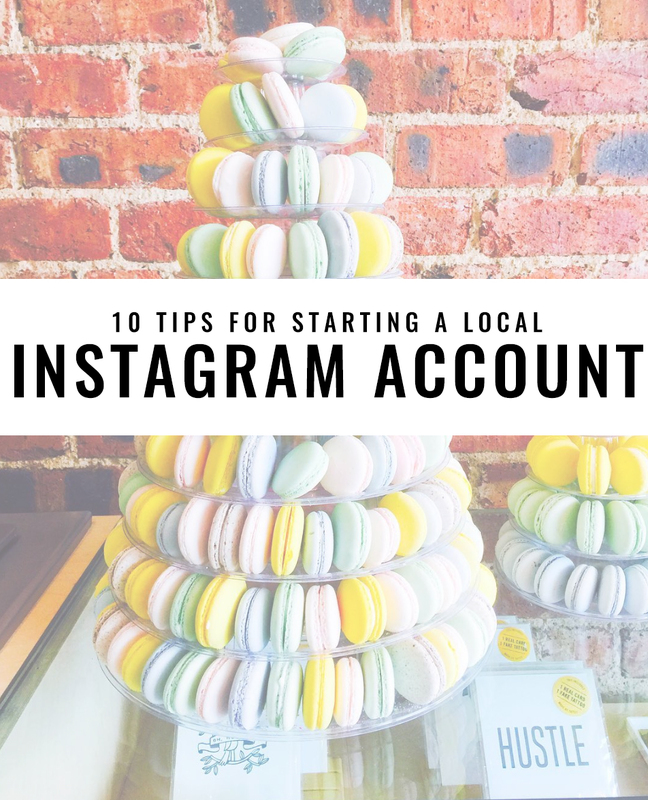 The ultimate goal when growing a new local account? GET REGRAMMED! 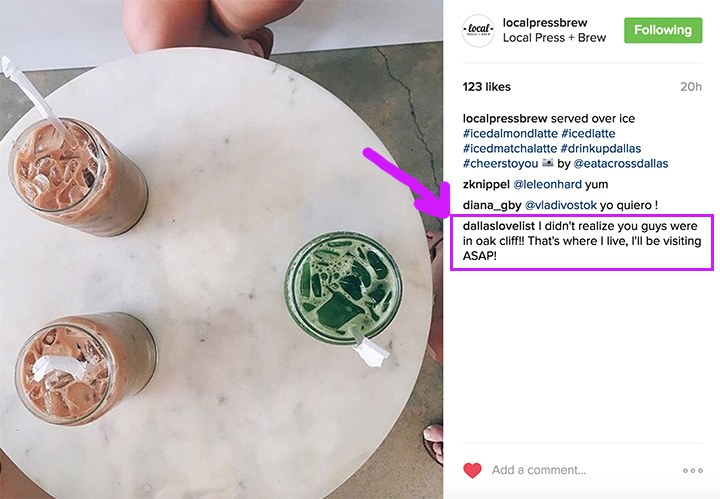 The more times you're regrammed, the more times you'll be shown to new local accounts that will want to follow what you're posting. The average instagrammer (see also: non-blogger) isn't following hashtags like you are, this will be a way to reach those people! This happened to me just a couple days in, and you would have thought someone awarded me an ESPY or something I got so excited. It helped too, I got a decent amount of new followers from it. The sun is out & no dog is required to enjoy a Mutts Burger on our patio! Love your pic, @dallaslovelist! Thanks for stopping by! This is the part where I get excited. CB and I are creatures of habit, and would eat at Waffle House every Saturday morning if possible. As much as I love Waffle House, there is a whole world of tasty treats and cocktails out there for us to explore! Next time we can't decide on where to go to eat or drink, I'll just reference my list and hopefully capitalize with a new photo suitable for posting! I still have some loose ends I haven't decided on, like will I include photos of myself in this feed, or will I remain faceless. Also, a lot of people will tell you to follow back anyone who follows you. I'm torn on this. While, yes, it is a great way to grow, I do feel like that somewhat decreases credibility. I might be wrong though, I'd love to hear your opinions on that matter if you have any? I think this could be an interesting project to follow, if you're into that kind of thing. I personally, am very into experimentation, as you saw if you read my post on Instagram Hashtags for Bloggers that will Triple Likes. If you want to follow along and see how the growth process is going, I'd love to have you! I'm probably already doing this whole "announcement" thing wrong, but I'm not good with waiting things out, I just get far too excited for a giant buildup. Click below to come play, if ya want! This is so awesome! It's making me want to get to Dallas even more! This is something I've been thinking about lately! There are a ton of great local bloggers in Columbus as well as Columbus focused accounts. Thinking of a way of combining my perspective as a young mother/native C-buser/working in fashion to make something awesome. This is a great post to get me doing instead of thinking! I have no intention to start a local Instagram account but read this whole post because I love how you write and think you are hilarious! Your blog was so helpful to me when I was starting my own blog! Followed! I'm in Fort Worth but I do adventure to Dallas from time to time! I love this! There are so many IGers in my city already but I would LOVE to start a local one of my very own. You are so genuine and have become one of my favorite "must-read" blogs! Thank you Nicole, that is really nice of you!!! What city are you in? Mine has a lot too, but I think there is room for everyone, especially if you make yours just a bit different! I'm in Philly, I love your new ig account. The photos are so great! The name of your new account is too good - what do you think about potentially expanding it to other cities and being somehow linked so that when people travel they get great recommendations and stuff? San Diego Love List, Nashville Love List etc.? What a great idea. I don't know another single blogger in my city and people often hate Erie in the winter, I should definitely do this and meet new people and boost up my city! I live in Erie, Pa and think we NEED something like this. Our city needs more love,and this would be a fun adventure. I totally want to use your idea, I hope you don't mind! You're so creative! okay this is awesome. love it! you are already totally killing it! This is so helpful! I've been toying with the idea of starting a local Insta account and now I've really got the motivation. THANKS!!! Do you think this is something you can make money doing? Or is it purely for the fun of it? I love the idea! Embarca no Eléctrico 28 e vem descobrir o melhor de Lisboa!